For quite a while I've been toying with the idea of getting a tablet PC. Although my laptop (Dell Inspiron) and desktop (Dell Vostro) PCs meet my needs for computing at my home office (running simulation software, data analysis, word processing etc. for my uni assignments), I sometimes fancy the idea of having the electronic equivalent of a paperback book for reading astronomy literature (mostly pdf files) and taking a few notes while in bed or in the park at lunchtime at work. The iPad is nice, but a bit too large to suit my needs (and too expensive for my taste), and the smaller, cheaper eBook readers such as the Nook and Kindle Fire didn't tickle my fancy enough to fork out more than $100 on one. I thought briefly about buying a cheap ($169) 10" tablet PC from Kogan, but the reviews suggested that a lot of corners had been cut to meet the price point, so I'd likely be buying a lemon and wishing I'd spent a bit more on a better tablet. In the end the specs, price and design of the recently unvieled Google Nexus 7 were enough for me decide to put in a pre-order for the 16GB version on the day it came out. It has the paperback book-like form factor and display quality I've been waiting for to read my uni pdf files on while in bed or my lunchbreak at work. It should also be good for Skyping while moving around the house, and for running some of the free Android Apps that are available (such as Sky Map). While I probably won't use Google Docs for word-processing or spreadsheets on the tablet (I prefer typing on a proper keyboard, and mostly use Word with EndNote's Cite-while-you-write for doing my assignments), I might end up using Google Calendar to replace my hardcopy calendar hanging on the cubicle wall at work. Unfortunately the AUD price for the Nexus 7 is $50 more than the USD price. I don't resent a small mark-up for Australian customers compared to those in the US (as if I ordered one from the US I'd have to pay a slightly higher delivery cost anyhow), but it would have been nice if Google had thrown in a $50 Play store credit for Aussie buyers to sweeten the higher price without eroding the higher margin Google will be getting from Australian customers. I also couldn't figure why the custom cover (an 'accessory') isn't available to order for Australian customers - if they can ship over the tablets, surely a couple of boxes of covers wouldn't be a problem? 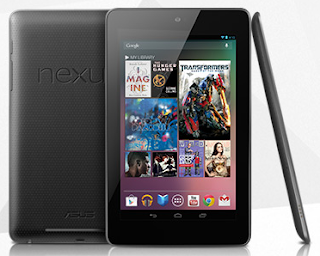 The Nexus 7 should arrive in 2-3 weeks. I'll see if it turns up on time, and then post a review once I've played around with it. Most reviews so far appear to be quite positive, and the 'missing' features (such as 3G connectivity, a front-facing camera, memory expansion slot) aren't really needed for my intended uses. My opinion? Be glad you couldn't order it -- there's no support that props it up for viewing on a table. This is just a carrier. I would suggest choosing a 3rd party cover/stand which has the magnetic closure feature. There is a video from one of the I/O developers that shows how a magnetic closure will put the unit to sleep automatically as soon as the case is shut. ...so far appear to be quite positive, and the 'missing' features (such as 3G connectivity, a front-facing camera, memory expansion slot) aren't really needed for my intended uses. Front facing camera is there (1.3 MP only), no rear camera.